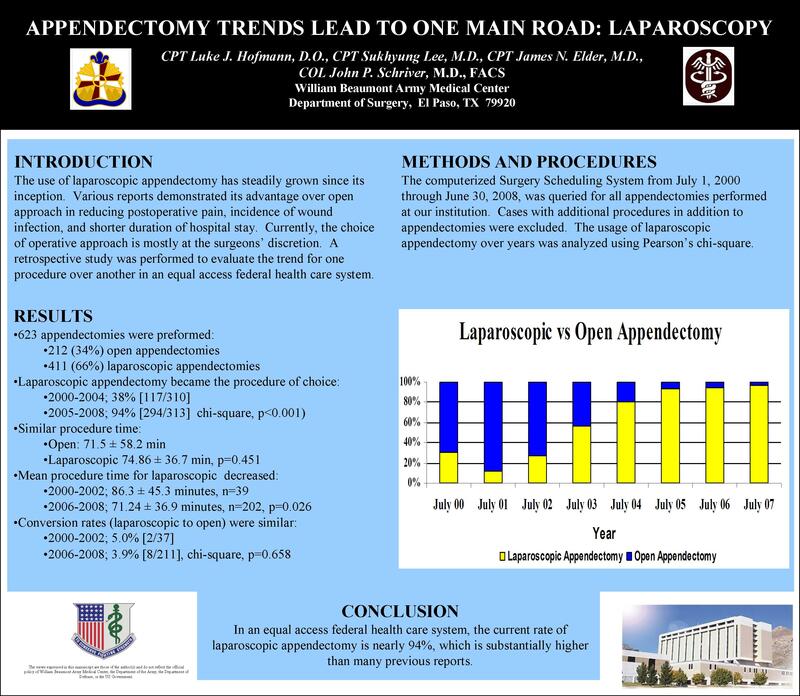 The use of laparoscopic appendectomy has steadily grown since its inception. Various reports demonstrated its advantage over open approach in reducing postoperative pain, incidence of wound infection, shorter duration of hospital stay. Currently, the choice of operative approach is mostly at the surgeons’ discretion. A retrospective study was performed to evaluate the trend for one procedure over another in an equal access federal health care system. The computerized Surgery Scheduling System from July 1, 2000 through June 30, 2008, was queried for all appendectomies performed at our institution. Cases with additional procedures in addition to appendectomies were excluded. The usage of laparoscopic appendectomy over years was analyzed using Pearson’s chi-square.